The Tomb of the Diver is an archaeological monument, built in about 470 BC and found by the Italian archaeologist Mario Napoli on 3 June 1968 during his excavation of a small necropolis about 1.5 km south of the Greek city of Paestum in Magna Graecia, in what is now southern Italy. The tomb is now displayed in the museum at Paestum. Detail from the underside of the top slab of the grave, showing a man diving into waves . It is a grave made of five local limestone slabs forming the four lateral walls and the roof, the floor being excavated in the natural rock ground. The five slabs, accurately bonded with plaster, formed a chamber sized — roughly – 215 × 100 × 80 cm (7.1 × 3.3 × 2.6 ft). All five slabs forming the monument were painted on the interior sides using a true fresco technique. The paintings on the four walls depict a symposium scene, while the cover slab shows the famous scene that gives the tomb its name: a young man diving into a curling and waving stream of water. Two masters have been distinguished, the south wall being by a less impressive artist than the others. When the tomb was discovered, these surprising frescos revealed its importance as they appear to be the "only example of Greek painting with figured scenes dating from the Orientalizing, Archaic, or Classical periods to survive in its entirety. Among the thousands of Greek tombs known from this time (roughly 700–400 BC), this is the only one to have been decorated with frescoes of human subjects." This was presumably inspired by the many Etruscan painted tombs; Paestum was at the time a few miles from the border of the Greek and Etruscan zones of influence at the River Sele. Wall-paintings in other types of building were common in the Greek world, but survivals are extremely rare. The local Campanians, who had taken control of Paestum by about 400 BC, left many painted tombs, mostly showing an obsession with horse and equine sport. Several of these are also in the museum in Paestum. In the interior of the tomb, only a few objects were found: near the corpse (widely supposed to be a young man, despite the heavily deteriorated state of the skeleton) were a turtle shell, two arýballoi and an Attic lekythos. This last object, in black-figure technique from about 480 BC, helped the discoverer and other scholars to date the tomb to about 470 BC. ^ Probably part of a lyre whose wooden frame had rotted away. 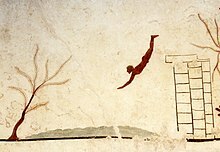 Wikimedia Commons has media related to Tomb of the diver in Paestum.